Sulfur. A macromineral that is necessary for collagen formation; is involved in the synthesis of protein; helps maintain the health of hair, skin, and nails; contributes to the process of cellular respiration; is necessary for proper brain function; is vital to the cells' ability to effectively utilize oxygen; and helps protect joint health. What are the health benefits of organic sulfur? Today, when most people think of nutritional supplements, they immediately think of vitamins. Although vitamins are certainly important to your overall health, they alone are not enough to provide your body with all that it requires to maintain good health. Minerals play an equally important role, for without them, vitamins cannot function properly. And, therefore, neither can you. Minerals are inorganic elements. This means that unlike vitamins, which are organic, minerals cannot be produced, or synthesized, by plants or animals. Rather, minerals come from the earth itself. Like vitamins, minerals are absolutely essential for your health, and make up between 4 to 5 percent of the adult body weight of humans. Minerals play many vital roles, working synergistically with vitamins, enzymes, hormones, and other nutrient co-factors to regulate literally thousands of your body's biological functions. Proper blood formation, energy production, nerve transmission, and regulation of healthy acid-alkaline balance are among these essential functions. Minerals also support healthy bones and teeth and are required for proper support of the body's overall structure and function. Sulfur is a macromineral that is found in all cells and body tissues, especially those with high protein content. The body's total sulfur content is about the same as its potassium content. Sulfur is necessary for the formation of collagen & keratin, and is involved in the synthesis of protein. Because it helps maintain healthy hair, skin, and nails, sulfur is sometimes referred to as the “beauty mineral”. Research studies have also shown that organic sulfur helps improve dermatologic conditions such as acne, dandruff, dermatitis, eczema, rosacea and psoriasis. It is also reported to slow down the signs of premature aging. Sulfur also plays a role in a number of enzymatic reactions, and contributes to the process of cellular respiration. It is necessary for proper brain function, and vital to the cell's ability to utilize oxygen most effectively. Sulfur helps maintain joint health and improves orthopedic conditions such as osteoarthritis and rheumatoid arthritis. Current research has demonstrated the effectiveness of organic sulfur as a beneficial nutrient for bone and joint health. 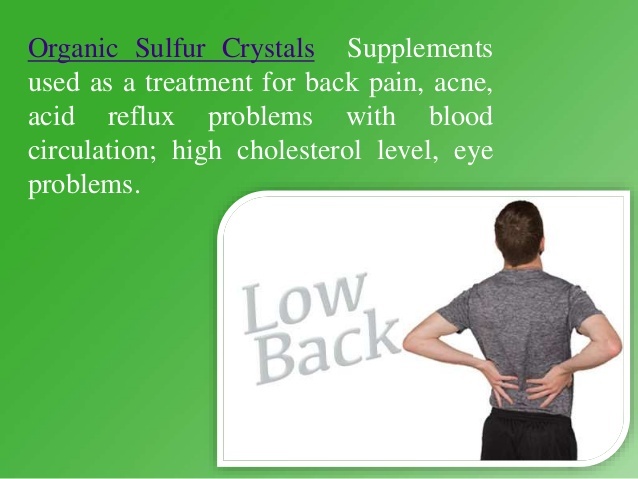 Daily supplementation of organic sulfur will reduce pain and swelling, improve joint flexibility, reduce joint stiffness, improve circulation and improve the vitality of your cells. People with sore muscles and chronic inflammatory conditions may also want to consider using sulfur as a supplement. An adequate supply of this mineral also helps ensure the body's detoxification processes, including its proper elimination of waste. Organic sulfur is essential for our body's production of glutathione which is one of the most important antioxidants that out body produces. Glutathione is necessary for removing heavy metals and many toxins that we're exposed to on a daily basis. Glutathione can't function effectively without sulfur. Low levels of sulfur can also interfere with the liver's detoxification capacity. Sulfur is involved in another pathway that helps dismantle, process, and alter neurotransmitters, steroid hormones like testosterone and estrogen, drugs, industrial compounds, phenolics (benzene-derived compounds used in plastics, disinfectants, and pharmaceuticals), and toxins from both intestinal bacteria and the environment. When your body is deficient in dietary sulfur, your body cannot effectively detoxify certain substances. And some of these substances that rely on the so-called sulfation pathway to be broken down and eliminated can be highly toxic. Research is now proving an association between dysfunction of this sulfation pathway and a variety of illnesses including Alzheimer's, Parkinson's, autism, rheumatoid arthritis, food allergies, motor neuron disease, primary biliary cirrhosis, and multiple chemical sensitivity. For many people, the sulfation pathway in the liver is the weakest link in the system's chain of actions. Because the body cannot produce sulfate on its own, dietary sulfur is critical. Great sources of sulfur include not only eggs, fish and meat, but also an assortment of vegetables: garlic, onions, celery, brussel sprouts, kale, string beans, soybeans, turnips, radishes and watercress. Organic Sulfur is commonly recommended to help promote bone, joint, and muscle health and alleviate pain. As a building block of every cell of the body, sulfur may provide numerous benefits. Sulfur has been used to provide relief from skin diseases, allergies, migraines, digestive disorders, Alzheimer's disease, cardiovascular disease, diabetes, lung disorders, autoimmune disorders, and cancer. 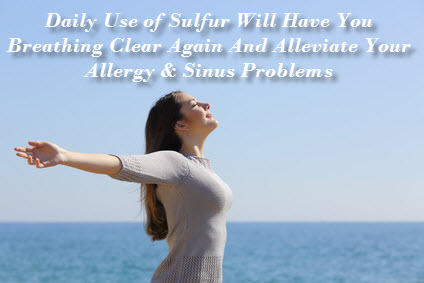 Sulfur also has antimicrobial properties and may help promote immune system health.